Michael Tiemann, President of the Open Source Initiative (OSI), takes a strong stand that unless a company uses an OSI-approved license they should not call themselves open source. Technically, nobody owns the open source trademark, it is a common mark that anyone can use and modify how they see fit. The community has a process with OSI that if followed lets a company use the OSI Certified mark. If someone doesn't follow this process in using an approved license or getting theirs approved, they don't have the right to use the mark. If they use the mark anyway, they will be both shamed by the community and potentially sued. But that's technically. Michael is suggesting that OSI and the community should defend the term open source, even through it doesn't have the legal means to do so. Open Source has grown up. Now it is time for us to stand up. I believe that when we do, the vendors who ignore our norms will suddenly recognize that they really do need to make a choice: to label their software correctly and honestly, or to license it with an OSI-approved license that matches their open source label. And when they choose the latter, I'll give them a shout out, as history shows. I applaud Michael's stand, as this kind of leadership helps move some core issues forward. Socialtext has advocated that commercial open source companies should follow the OSI process and gain OSI Certification, as we are. I've said that we won't use the OSI Certified mark until we have earned it, but use the term open source. However, while this is technically correct, I'm concerned about the unfolding rift in the community. I am to blame for part of it. When we submitted the Generic Attribution Provision (GAP) to OSI back in November we tried to both gain certification for an MPL+Attribution license, and do so in a non-standard way. We sought to have attribution be a provision you could add to any of the 50+ approved licenses that allowed for extension. While this might result in a more favorable taxonomy of available licenses and make license proliferation more future proof, we didn't follow the process correctly and submit a complete license. We then took too long to draft and submit the Socialtext Public License (STPL) in March. When OSI was going to vote upon it this month, we didn't have enough time to incorporate feedback, test the draft of the Common Public Attribution License (CPAL) against our own goals and have time for the OSI-discuss mailing list to vet it. Sure, OSI itself could have moved the process forward, but ultimately I could have driven it better. Approximately 40 companies use similar licenses without following this process and are looking to us for leadership. I'm not certain how many will adopt CPAL if approved, but I have a role in why there is no conclusion to certifying an attribution license, yet. Most of our developers have a long track record in open source. Having things take so long and with less than perfect execution effects them personally. Which brings me to the point of Michael's post, on using the term open source. We've had a lot of conversation within our company wiki about this over the past few months. Casey West, in particular, took me to task for us taking the position of using the term open source, but not the mark OSI Certified. Technically, I'm not sure what we should call ourselves right now. We are following the process and have committed to using an OSI approved license one way or another (if ours is not approved, we will adopt an approved one, even at commercial cost). Even edits on our Wikipedia page, from friends of ours, say we are not open source. So what I'd like to hear from the community is what we should call ourselves. If the consent of the community isn't open source, but to use a different term, I'll edit our site and wiki appropriately. It should be a short term monkier for us, but I believe it is our responsibility if we want to be part of the larger open source community. Notes will probably be shared on the Enterprise 2.0 Wiki. Sam Weber the VP of Technical Services is a 1.0 veteran on the Enterprise 2.0 launch pad. No longer selling and supporting software that users hate to use. 50% of email is jumk, <20% find portals useful, 16 clicks to find information and 50% of searchers are successful. Sharepoint is a significant problem because of the diffusion of sub-portals. Big architecture slide time: they monitor data from multiple sources, automate relevancy, transform and deliver and manage information. We do more than RSS for integration. Launches KnowNow Live. Has a Netvibes like homepage where you can drag content objects, with a sidebar on the left of channels to select from. Its an aggregator with a portal like UI you can personalize. Stowe: I want more demo and less pitch. I see you having a hard slog battling the huge CMS guys who are going to provide this. Then you have consumer options like Pageflakes chipping at you. Like 9k people in your space. David: I met these guys a year and a half ago, nice to see the launch. Those who do the aggregation make the money. You have a lot of good customers, but the question is it 9x better than email? Ross: Good component in an overall aggregation play. Dave Peak, on the Enterprise 2.0 launchpad, with Liquidtalk. Right now, how many of you are checking your blackberry. The reality is we are out of time, are out of the offfice, have few cracks in the day to get it done and few chances to connect in real time. Difficult to collaborate when out of the office, hard to get knowledge on the go, productivity plummets when on the go. Attracting the best talent means helping the next generation get their information immeadiacy, place value on peer input. Roles are getting tougher while expectations are higher, with rising rep turnover rates, high dependency on top performers. A disengaged and disconnected workforce means lost productivity and lost revenue. Our answer is mobile workforce engagement. Create, find, organize and push audio/video business content to mobile devices. Leverages the most powerful means for collaboration -- the human voice. Liquidtalk portal lets a rep gain access to video and podcast files, and synch them to their mobile device. The inbox is about things pushed to his list by his boss to consume as well. Liquidcast lets you phone in a podcast to the Liquidlibrary. Dave Coleman's take: This is more interesting, would like for new vendors to explain what they do in one slide rather than five or six. I thought this was more of DVD for conversations that you can timeshift. You are more like Tivo than iTunes. I find podcasts useful, but as information transfer than knowledge. Stowe Boyd's take: I feel to compelled to talk about the slideshow because the buildup was different. I have the sense that this is a feature. Creating content seems like work, but if it was part of something larger, such as being part of Salesforce.com and its activity. Ross' take: there are a lot of podcasting companies and tools in the space. This seems well focused for enterprise use. Every product starts as a feature. Speaker - Mike Fratesi, Manager, Solutions Marketing, Unified Communications, Cisco Systems, Inc.
Mike Fratesi Solutions Marketing Manager, Unified Communications Cisco Systems mfratesi@cisco.com Mike is responsible for unified communications applications solutions marketing at Cisco Systems. He joined Cisco Systems in January, 2004 upon the acquisition of Latitude Communications, a maker of conferencing solutions, where he was the Director of Product Marketing. In over 7 years at Latitude Mike helped drive the product direction and marketing of the MeetingPlace conferencing system. Prior to Latitude he was a product manager in the Pentium processor division at Intel and a consultant at Booz-Allen & Hamilton. Oliver is an analyst at Forrester Research, Inc. covering Web 2.0 , Enterprise 2.0, and Social Computing - including blogs, wikis, RSS, social networking, and mashups - and its impact on technology vendors and the overall tech industry. As part of this coverage, Oliver also looks at broad economic trends in the tech industry. His work has been cited in major media outlets such as ComputerWorld, BusinessWeek, The Financial Times, and The Wall Street Journal as well as influential blogs such as Rough Type and Read/Write Web. Prior to his analyst role, Oliver served as a researcher at Forrester. Oliver is a graduate of Kalamazoo College with a B.A. in economics and English. He has also studied at the London School of Economics and Political Science. Toby: We had a KM system where you can put information in if you had a password and could remember where stuff was and the password. Turned on wikis 4400 blogs and 4200 wikis. Didn't even tell anybody, just turned it on. Plus forums and FAQs. There is a community that has the collective knowledge of the last twenty years of the company. This accelerates the clockspeed of the company. We are implementing Baynote and Scuttle for folksonomy. I thought it would be utter crap, Arlo Guthrie doing IT, but it actually works, seeing heat maps and accelerating discovery and learning. 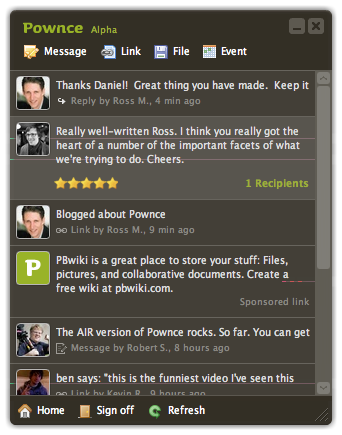 Widgets, social networking with Visible Path. The key is that it just has to be so easy to use for adoption. Don't train, advertise it, did have to explain scuttle a little bit. The higher up you go in the heirarchy the less it is used, a good thing, the real work is elsewhere. Oliver: What I see is a bit of a dichotomy. The marketing and communication departments, the lines of business are excited about these tools. But IT has a lot of fear. They look at these tools and think they are decentralized, emergent, not easy to control and my employees are doing this anyway. The command and control thought, keeping CIOs up at night. They learned a lot of lessons from IM, where employees used it anyway. A lot of companies say we can't lock it out, lets figure out how to do this. For those who are bringing it in, it is in an experimental phase. Far less common that you find someone that says lets change things. At Motorola you have cool tech that rolls out under the covers, something common, but it limits the potential impact. Mike: Coming from the unified communication space, WebEx acquisition, getting into collaboration and deploying it ourselves. We want to give people more immediate access to their experts. A huge amount of growth in real time collaboration, moving people beyond the phone. A ton of inefficiency needs to be driven out. Integrating people, processes and data and making the communications a core part of the effort. Moving from an ad hoc deployment model to a multi million dollar initiative to redo our Intranet. Making it easier to build communities of interest, from mailing lists that overwhelm. Chambers is talking all about collaboration, for our organization and our customers. Toby: You have to have a small team to do this. One manager and four people. The actual information is driven by 250 knowledge champions, selected by the community. A badge of honor to be a champion, shepard the wiki. I get calls that say, did you know we have 4000 blogs, are they doing anything bad? Yeah, probably. Can we control it? Yes, give me 400 people to monitor it, but it will kill it. They schedule a meeting and I don't show up and life goes on. I don't beat competition through better buildings, companies are human beings solving problems, driving opportunistic events by working with dumb stuff like buildings and cash. Its like Chess. You move once, I get to move twice. Who do you think will win? That's what a community platform gets you. Oliver: To some extent the security question is paranoia, but all security is paranoia. Stealing a laptop is a bigger risk than email or blogging. External blogging means that with a big organization, someone is, and in regulated industries it is a serious issue. Adoption is happening in your enterprise whether you like it or not. In a survey, leaders estimated 20% were using these tools. Those making no investment had about 3-8%. Need to give guidelines about what is appropriate. SaaS lets a business unit leader get my entire group up and running for $20 on Socialtext, for example. Without involving IT. I have a lot of faith in Socialtext that they are a secure service and not losing data. But you have to have a story if it runs up the chain through IT to explain it. The final way is frankly Sharepoint. Have to put policies in place. Mike: Cisco is really trying to change the way we work. We are moving to collaborative communities at all levels towards the goal of growth. We have people with deep expertise that are difficult to locate. The mandate Chambers gave to IT, which has done a great job, yet there are ways to better respond to users needs, so they are investigating Enterprise 2.0 and how to integrate it with communications. From the bottom up perspective there are wikis across the organization, they aren't integrated and you have to support it yourself. Wiki is a much better way for managing projects, such as a product launch that is a massive cross functional effort. Toby: I was a young guy once. A quick comment, not to pick on Motorola because they are a competitor. You have to build it as a platform, with freedom to use, because if it gets big it will be out of control. Needs to be searchable, enable migration. But to answer the question, you can't tell people not to multitask. The old school pre web people were actually some of the biggest adopters. Super simple to use and really useful. These are people with greater knowledge and more to gain by using these tools. In some places, I don't know, Kentucky, it may not be that way. But we found the adoption curves were pretty much even across the age groups. 40+ a little more usage, but the closer you get to real work, the more it is used. Oliver: some workspaces are earlier adopters and cultures for new technologies. At Northwester Mutual, their employees are mostly older, 33% retiring in 5 years, and they are struggling with this. In youth, 77% are creating content, but at 41-50 only 21% do. Even people who are reading, there is a group of people who don't even participate in this way. You are dead on with the knowledge champion role, the evangelists who can show people the way. One or two people you have the propensity to adopt start using them, and to better effect, and the guy next to them sees and copies so he is not at a disadvantage. The stealth launch needs support for the spread, for the evangelists, but having someone see how it is valuable to them in their business context is the real goal. Asked a law firm and they said the older lawyers weren't jumping on these tools, as they were with Blackberries initially, now he can't pry them out of their cold dead hands. Need time and familiarity, and the right to fork. Toby: hard to measure the results. Old school companies built campuses for a reason, discovering people by bumping into them which indirectly helps projects. We see this happening 10k times a day. Inside IT we are seeing the cycle time on delivering product and getting stuff done really ramp up. A little medium is the message going on. I see less email, which is the worst thing going through an enterprise. Oliver: really hard to measure. Same with email or a portal, a soft ROI. Hard to put saving five minutes a day into dollar terms. And it takes a leap of faith. At the same time it depends on the installation. One company that rolled out wikis, took a legacy database that tracked IT standards, said we can put it all in a wiki, have every IT employee update it on their own when things change. Moved two people off of the project and on to something else. Toby: you can tell lots of stories like this. Before and after with a sales wiki: borrowing materials, building a pitch, find the 12 people who worked on something like it before. People in logistics see four red things in a dashboard, click on them to the wiki. I say cycle times are down 12%, they say that's great how did you measure this? I made it up, but it was based on the best information available. Oliver: Employee surveys are a good approach. Surface anecdotes. Toby: The question how do you help people understand how to search and tag appropriately. We have 2600 users on Scuttle, but a bunch of people who look across tags. All of it is a simple one page description of how you do it, if you need more it is not the right solution. I stole a rule from the CIA: if you can't feed the team in two pizzas, get someone off the team.